So, let’s get this straight: Obama wants gun-free zones. And if a criminal (who by definition would break the law) comes in with a gun, Obama wants to reassure the American people that they can fight back with scissors. 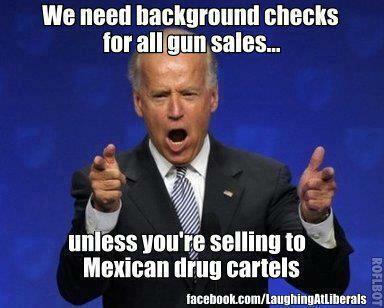 As for Obama, he’s decided keep his gun-toting 24/7 armed security team for the rest of his life. Obamacare is a tool of tyranny. As the GOP always knew, Obamacare is a tool of tyranny. You don’t even need to be anti-gun control to find it repulsive that Obama is now using Obamacare to compel doctors to ask their patients about gun ownership and “gun safety.” This isn’t a question of health or security– this is about freedom and privacy. Obama should not use legislation such as Obamacare for unintended purposes so that he can advance his political agenda. There are certainly desirable gun control measures that should be taken– but Obama won’t let the American people have stricter background checks unless they also accept a national database of law-abiding gun owners. It’s all or nothing, to Obama. While he was an Illinois state senator, “Obama opposed legislation providing an exception to handgun restrictions if the weapon was used in the defense of one’s home.” That’s the rule that Obama wants applied to all American citizens– you can’t use a gun EVEN TO DEFEND YOURSELF FROM AN INTRUDER IN YOUR OWN HOME. YET, Obama has signed a bill “which will cost American taxpayers millions of dollars” that will give him armed bodyguards for the rest of his entire life. Obama wants guns to protect his life, but not yours. AND, Obama wants his kids to have armed guards at school– but he doesn’t want your kids to have any such security. Obama says he is “skeptical that the only answer is putting more guns in schools” after the Sandy Hook Elementary massacre, but has ensured that there are 11 armed guards on duty at all times at the school that his two daughters attend in Washington, D.C.
Obama isn’t merely a hypocrite– he’s an elitist who believes the law doesn’t apply to him. Obama-endorser NY Mayor Bloomberg enjoys being a tyrant. Democrats’ last hope: Disenfranchise military voters. Thanks to Obama’s Department of Defense, thousands of voter ballots are unlikely to reach military service members until after the November 6th election. If the Democratic Party actually cared about democracy and freedom, it would argue that these military voters should be able to vote via e-mail or fax the same way that voters in the mostly-Democratic precincts in Hurricane Sandy-hit states are being allowed to vote. The Democratic Party is committing rampant voter fraud in this election– it’s all over the news, out in the open. On Election Day, Romney will need to win by enough votes to overcome the “fraud” margin.